It's become all too obvious over the last three and a half years that we're quite keen on the occasional list here at ShortList. Alas, to our detriment, of the 1,568* lists we've made since day one, most have been entirely our own opinion. And we're usually wrong. Props then to the ultimate FA Cup XI which was picked by tens thousands of football fans who are far better qualified than us to give their opinion. The poll, ran by the fine people at ESPN Soccernet lists the 11 players above, with Sir Alex of Ferguson as manager, as the finest to ever grace the most romantic trophy competition in the world (bar the Lovers' Award). In the poll Eric Cantona was hailed as the all time Dream FA Cup Player. Oddly, not Nottingham Forest's Lee Glover. 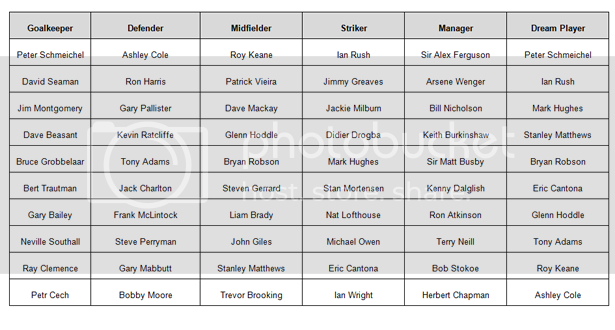 With the third highest vote total, Ashley Cole’s FA Cup record of six Final wins has seen him selected in the Ultimate XI’s defence alongside Tony Adams, Bobby Moore and Gary Pallister. Ryan Giggs received the most total votes, and led an all-time FA Cup midfield where he was joined by Steven Gerrard, Patrick Vieira and Roy Keane. Fans selections up front was Ian Rush and Cantona, while Peter Schmeichel was selected as the all-time FA Cup goalkeeper.